Get Vendio Gallery - Now FREE! 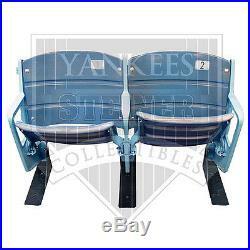 Steiner Sports Double Seat Pair from the Original Yankee Stadium. Take a seat in history with an authentic pair of seats from the original Yankee Stadium in the Bronx. Salvaged following the final game of the 2008 season, these seats are the most talked about, sought after collectibles on the sports market, and arrive an official letter of authenticity. Set of 2 attached seats. Seat pair can stand alone. Armrests are repainted as the originals had lead paint. Seats have not been used since being pulled from Yankee Stadium and are unopened in original Steiner packaging. Some seats may be slightly faded due to sun and environmental factors, but such is the reality of authentic game used seats. Total, 49"W X 35"H X 19D. Seat numbers are selected randomly. A Yankees-Steiner Sports Certificate of Authenticity is included. MLB Holograms of Authenticity are included on the seats themselves. Be sure to check out our other items for more great deals on Steiner Sports Memorabilia! The item "Steiner Authentic Game Used Yankee Double Seat Pair from the Original Stadium" is in sale since Thursday, July 16, 2015. This item is in the category "Sports Mem, Cards & Fan Shop\Vintage Sports Memorabilia\Other Vintage Sports Mem". The seller is "magical8ezg" and is located in Westfield, New Jersey.